For more than 40 years, the Departments of Physics and Astronomy and Department of Curriculum and Pedagogy at UBC have been collaborating in hostingt UBC Physics Olympics – the largest hands-on physics team competition in North America if not worldwide. On a March Saturday morning, teams from high schools across British Columbia compete for medals in 6 science events, and the school of the team with the highest overall score will receive a trophy and other awards. Since 2010, I have been a member of the Physics Olympics organizing committee and I have been representing the Department of Curriculum and Pedagogy since 2012. In 2018, we celebrated 40th UBC Physics Olympics with more than 700 students in attendance. 2 Faculties and 2 departments collaborated on the event! 2 Media Outlets came to talk with the students and teachers: Ming Pao newspaper from Richmond and CBC. 15 teacher-candidates who brought their teams and who dropped by to watch the event! 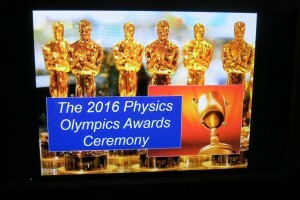 38 years of Physics Olympics! 50+ parents, siblings, grandparents and friends who came to support their teams! 59 participating teams from all over BC! 1000s of laughs and an uncountable amount of physics fun! MANY THANKS to all of you for coming. Please keep in touch and if you have great ideas about possible collaboration in physics outreach and physics education research, or improvements to the Physics Olympics please let us know.